Rigid. Rigidity. How flexible is something, it could be anything, a spaghetti noodle is a good example. At first the spaghetti noodle is very brittle, it’s rigidity is higher at it’s shortest length, but as it continues to get longer it becomes more and more flexible, losing the integrity of it’s rigidity. Or you can take the noodle and stick it in boiling water, depending on how hot the water is (simmering at 110 degrees fahrenheit – 115 degrees fahrenheit, or boiling at 212 degrees fahrenheit) and/or how long the noodle is submerged will affect how rigid it is, this time actually making a difference in the noodles structure causing it to become more and more pliable no matter how long or short. It can be pulled, squashed, and of course looped around itself. Anyhow, the point is, do you prefer your noodles to be firm or soft? If the noodle were to replace the crossbeam on the Brother’s foot pedal, you would want it to be very stiff, and have a highly rigid structure. 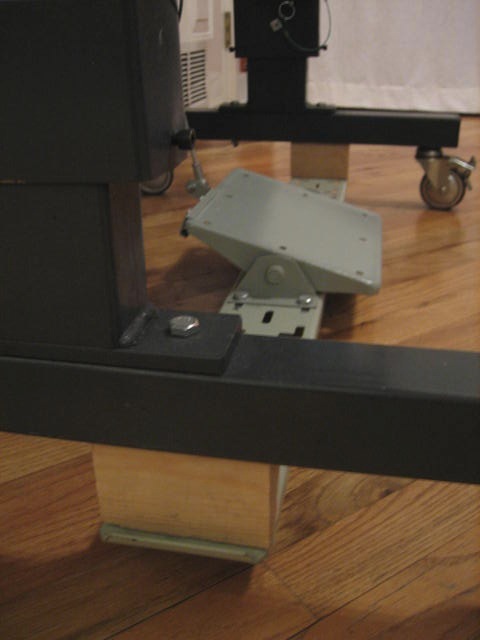 Part of keeping all of these parts from losing that rigidity was in making sure that where there were connections between the table stand and the crossbeam, that the bushings (used) provided the largest footprint to utilize as much surface area for rigidity as possible. Closing the tangent. The crossbeam was about 4″ wide, but would only be able to use one bolt – through the center (one at each end of the beam) – for it’s anchor. So as you can imagine it was important to use that four inches of surface area as best as possible. 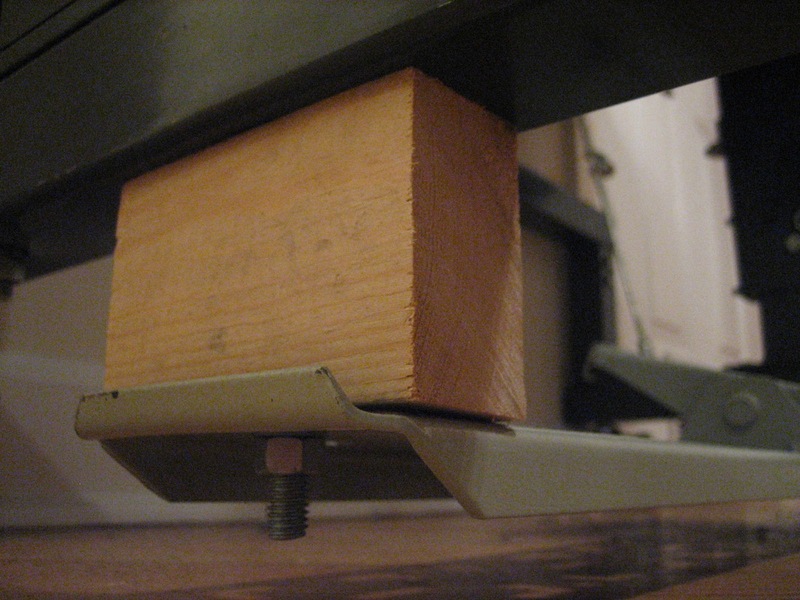 Taking a 2″x4″ section of wood, cut into 4″ sections – the crossbeam could be lowered from the sewing table’s existing legs about 3.5″ and fit almost perfectly between the sewing tables legs/base (which is made of 2″ square steel tubing) and the crossbeam*. 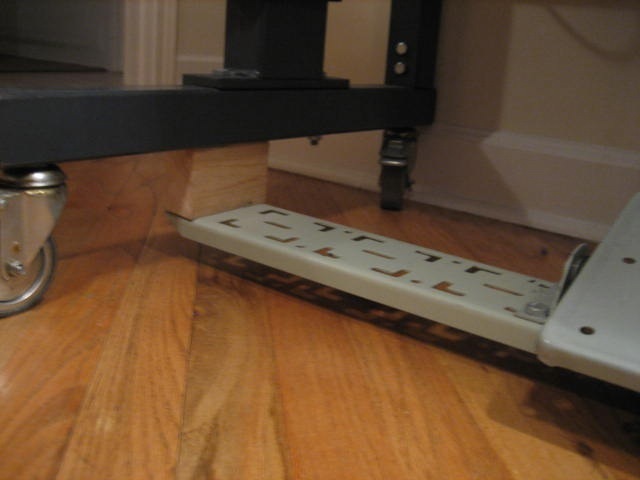 What we have here is a 2″x4″ wood washer – spacing out the pedal from the table’s legs/base to the as close to the floor as possible. 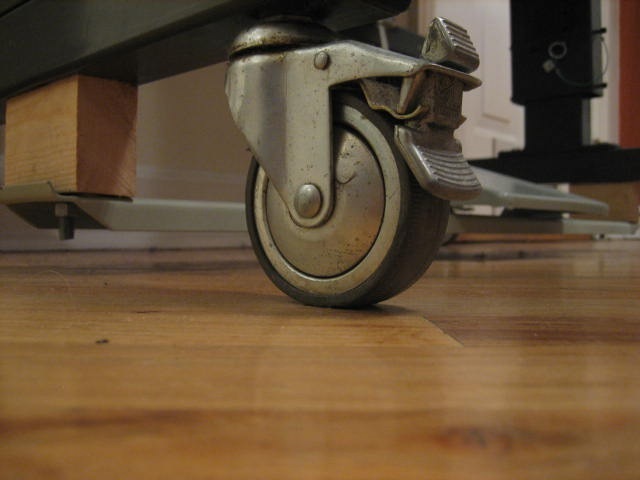 If the pedals crossbeam were bolted directly underneath the tables legs/base, it would sit about 4″ – 5″ off of the floor which is not comfortable at all, your leg ends up being cramped up (like driving a car a long distance with the seat pushed too far forward). As you can see in the images, all you need is a couple of blocks of wood. 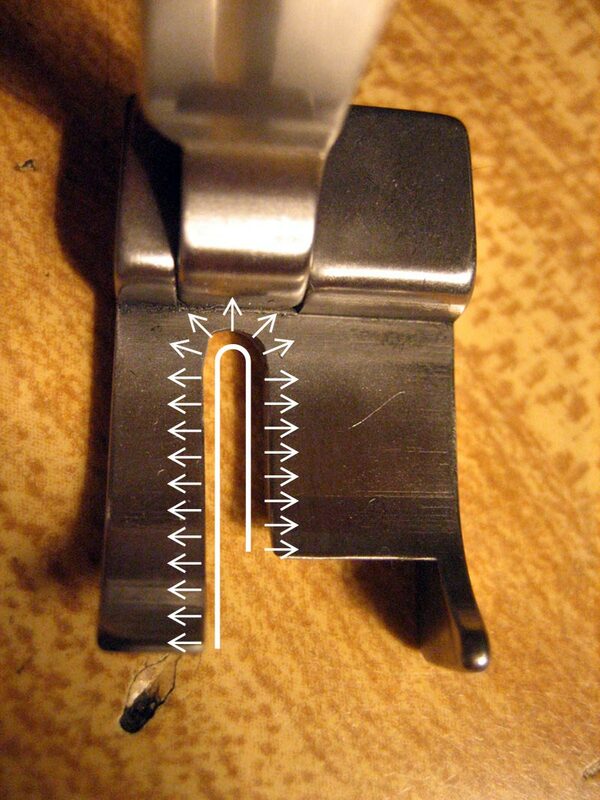 Also, with the extra threads on the bolt, there is still room to lower the entire pedal assembly another 3/8″ of an inch, obviously there are more threads available but the nut needs to be fastened somewhere. Bringing the assembly down that last 3/8″ would be better, as right now it is hard to get a good position while your seated. Raising the stool height to extend the leg more has helped, but it is still not quite right, plus every time the stool is raised you have to raise the table top too, so it can be a never ending battle. *It is not really a beam, but instead a sort of plate. It is essentially a piece of flat bar stock that has had its two long edges bent at 90 degrees towards what would be its bottom end or base. By this time the Machine has an outlet, the Brother is receiving regular 110 volt current to it’s new clutch motor. The motor is installed with no tangles. And even the presser feet are under control. The pan has oil in it, the table is level (the leveling system should be an entry on it’s own. It is a truly beautiful mechanism that keeps this factor under control – and of course it is probably strong enough to level the Bay Bridge. ), the needle-bar height has been adjusted, and the new feed-dog and throat-plate are in place. The lamp is in working order, which was accomplished by splicing and hardwiring the lamps electrical cords into the power switch, so that it can be turned on independently of the Brother – without the Brother needing to be turned on (this also leaves the 6 volt outlet on the motor free for a second lamp or any other small appliance. The reason for it being 6 volt is another entry). Now it is time to tackle the treadle system. The treadle system has a long history, and unfortunately it cannot all be contained here, but because it is valuable information we will discuss it in brief. For now we will uncover just a little bit of it’s lineage in terms of mechanical function. A present day treadle is not really a treadle at all – often these terms are confused – contemporary machines use a “pedal”, like that of any other type of machine which uses acceleration provided by a source outside of ourselves. Unlike the treadle – which is a type of pedaling mechanism we would see on a very old Singer, that does not merely engage motion, but actually generates it. 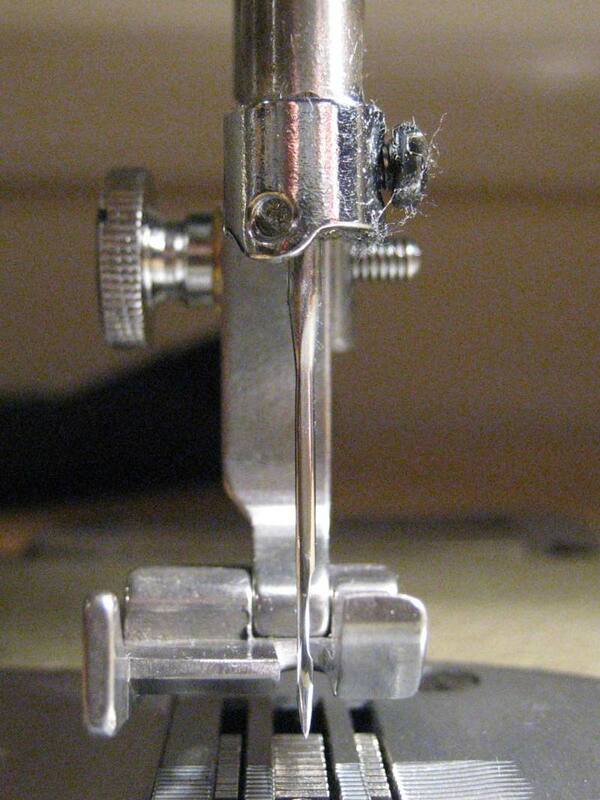 What the treadle does is power the sewing machine under human force. 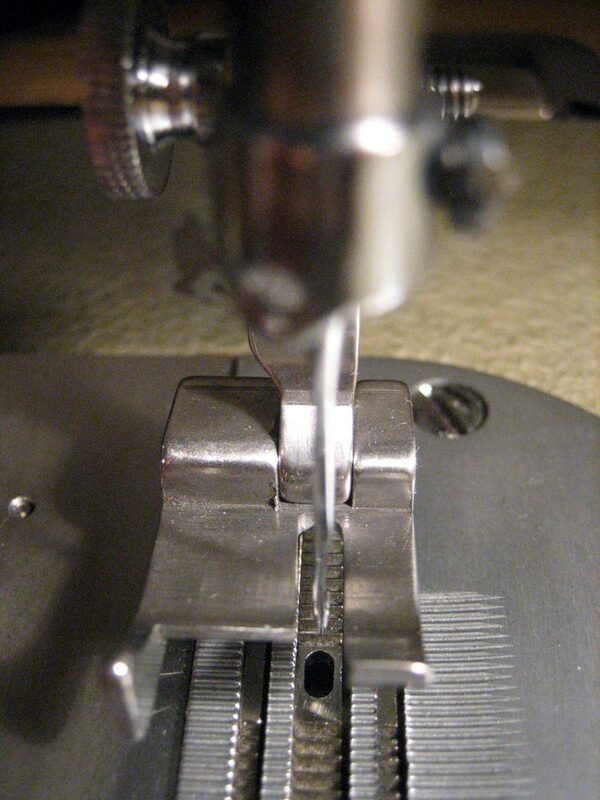 Sitting at your sewing machine you gently get the belt going with a rocking motion of the pedal, and thus the drive activates your machine head. There are many advantages to this older-style of operation, the main benefit is that it will always work – living off the grid with no electricity, sewing on top of a mountain for your sanity, or even taking one to the moon (perhaps bottom of the ocean would be more politically correct) for posterity. Also, a treadle powered sewing machine is often more quiet, and very easy to service (considering that few mechanical parts are involved and how exposed they are to the user), lastly how could you deny the added health benefits, both mentally and physically. Unfortunately, this format did not last, and in 1889 Singer introduced the first “practical” electric sewing machine. This advent in sewing technology remedied the need for a treadle and made the electric- motor-with-“foot pedal” the new common denominator. Needless to say, the Brother DB2-B791-015 needed a new foot-pedal to operate the motor, not a treadle. All of the parts were available: the crossbar, the pedal, the treadle-bar, and the associated hardware. Although some of this was kinda crappy hardware so some improvements were made, rubber bushings were placed between the pedal’s pivot location and the mounting brackets receptors to keep it quiet, and to keep the pedal centered between the two brackets, which could not be mounted quite close enough to keep as securely in position as was desired. 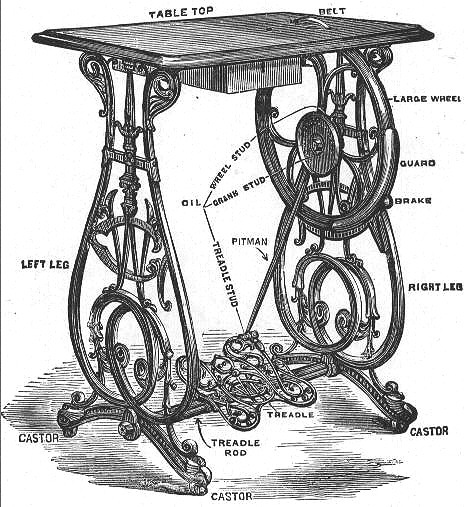 Also the treadle-bar was mounted so that it rose from the most central position available on the foot-pedal, ideally to help distribute load and to make a direct connection from the pedal to the motor. With all of this hardware sorted out it was time to devise a strategy for attaching it to the existing tables legs. But because these legs were not intended to have a cross bar with a common pedal/treadle configuration it would cause the pedal to be too high up. On the older brother of the Brother, the Singer 600WI, the pedal was as close to the floor as possible which came to be a very desirable position, it was very comfortable, and structurally sound. So the main issues were that the whole piece was as low as it could be, and as rigid as it could be.